This coming Sunday, Hallmark Hall of Fame presents a telefilm version of Jewish playwright P’Nenah Goldstein‘s romantic drama stage play, “Loving Leah.” (Sunday, Jan. 25, 9-11 p.m. on CBS) I had a chance to see the telefilm in advance of the TV showing and I did a telephone interview with interfaith actor Adam Kaufman, 34, who plays the male lead character, Jewish doctor Jake Lever. Though Loving Leah is better than most romantic comedies or dramas in the movie theaters, it’s not Pulitzer Prize material. You almost always know where the story is going and some plotlines, including an interfaith one, wind up just a bit too neatly. Nonetheless, the excellent cast smoothes over these bumps. 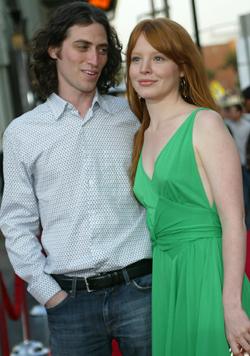 Lauren Ambrose with husband Sam Handel. Photo: Reuters/Michael Buckner. Best of all, there is actress Lauren Ambrose, 30, in the title role. Ambrose, best known for her role as Claire Fisher, the daughter on the television show Six Feet Under, is a truly gifted actress who gives a nuanced and luminous performance as Leah. She proves that you don’t have to be Jewish to turn in a sterling performance as a Jewish character. Ambrose was born Lauren Anne D’Ambruoso to an Italian Catholic father and a non-Jewish mother (I’m not sure what her mother’s specific background is). Co-star Adam Kaufman told me that Ambrose did a great deal of research among the Hasidic Orthodox Jewish community of Brooklyn in advance of the film’s production. This is Ambrose’s second major Jewish part. She got great reviews in her Broadway debut in a 2006 revival of “Awake and Sing,” Jewish playwright Clifford Odets‘ (1906-1963) famous play about a Jewish family during the Great Depression. I strongly suspect that Ambrose’s husband, photographer Sam Handel, is Jewish, but I haven’t been able to confirm this yet. As the film opens, Jake Lever (Kaufman), a 30-year-old Jewish cardiologist in Washington, D.C, gets a phone call telling him his brother Benjamin, a Brooklyn Hasidic rabbi, has died unexpectedly. Jake and his mother are not religious and both have largely lost touch with Benjamin over the years as Ben became religious and, later, a rabbi. Jake and his mother travel to Brooklyn for the funeral where they meet Ben’s widow, Leah, and Leah’s mother (played by Jewish comic actress Susie Essman, 53). Actress Natasha Lyonne, 29, of American Pie fame, has a nice little supporting role as Leah’s sister. Lyonne, by the way, was deathly ill a few years ago. Her illness was allegedly the result of drug abuse. She appears healthy now and she says she is doing pretty well in a short profile in the current issue of Heeb magazine. Kaufman also told me that she is doing fine and she is very funny in real life. Back to the plot: Jake is shocked when, shortly after his brother’s funeral, he is asked to honor the ancient Jewish Levirate marriage law. As a single man, he’s expected to marry the childless Leah to carry on Benjamin’s name…or else deny his brother’s existence in a religious ceremony that will release them from this generally un-enforced Jewish law. Despite his serious relationship with Carol (Christy Pusz), a beautiful doctor who works at Jake’s hospital, Jake finds it unthinkable to deny his brother’s existence. He impulsively suggests he and Leah marry and maintain a secretly platonic relationship in Washington, D.C. Leah gladly accepts as a means of finally pursuing her own dreams of independence and a college education without offending her very traditional and domineering mother. Leah has always been a bit of a closet rebel–she often snuck out of her house to see Hollywood movies at revival movie theaters. This is something that a Hasidic rabbi’s wife should not do; it’s too worldly. It is implied, but not stated in so many words that Jake’s girlfriend, Carol, is not Jewish. Her classic WASPy blonde looks and the way in which Jake has to explain a few Jewish customs to her leads one to that conclusion. To the telefilm’s credit, Carol is not depicted as insensitive or unreasonable. She initially encourages Jake to keep in contact with his dead brother’s wife and her mother. She is, of course, shocked when Jake marries Leah and makes it clear to him that their relationship is essentially over until he divorces her. Carol’s reaction is but one of the hurdles that Jake and Leah face when they try to live as roommates in Jake’s apartment. Another is an unexpected visit from Leah’s mother, who suspects her daughter’s marriage to Jake is a sham. As you probably can guess, Jake finds one or another excuse to put the divorce on hold and what began as a platonic marriage becomes a romantic one. Along the way, Jake comes to appreciate aspects of a traditional Jewish religious home that Leah brings into his life. Leah, for her part, moves a lot towards Jake’s side of the Jewish observance spectrum. She dresses in a more modern fashion and starts to attend a nearby Reform synagogue where she is befriended by the rabbi played by Jewish actress Ricki Lake. Like a lot of feel-good stories, even high quality ones, Loving Leah artfully avoids some issues that could break the romantic spell for the audience. The fact that Carol is not Jewish is not addressed in the script. Carol never raises the issue of religion or whether Jake is attracted to Leah because she puts him in touch with the spirit of a brother he loved or the Jewish culture he seems drawn to when it is served up to him on a silver platter (or in the form of Leah’s excellent Jewish home cooking). I asked Kaufman about Jake’s break with Carol. He said at the beginning of the film, Carol is talking about bridesmaids, so you assume Carol and Jake are engaged. But, later, you find out they haven’t actually been formally engaged, despite dating for 18 months. Then, near the end of the film, Jake confesses that he never really intended to marry Carol. As Adam Kaufman put it, things were long comfortable between Carol and Jake and, like a lot of couples, they just went along without really discussing how into each other they really were. It took Leah’s presence to force Jake to recognize that he didn’t want to make a life with Carol. Jake’s confession is an easy out. In effect, Leah did Carol a favor by ending Jake and Carol’s ultimately dead-end relationship. Near the end of the film we see that Carol has landed on her feet, as it were, and is dating another handsome doctor. That’s nice for the Carol character, but things are usually not so neat and tidy and painless in real life. Loving Leah dances around the issue of interfaith relationships and cultural affinities, but never confronts them head-on. But, on its own terms, it’s certainly worth watching. And, as the tabloids would put it, a lot of ladies will like to watch Kaufman. He’s so handsome that he could be a GQ model. Kaufman was born in Virginia, but mostly grew up in Connecticut. His father, he told me, is Jewish, but secular. His mother is a practicing Catholic, but attended church only a few times a year as Adam was growing up. Adam says that he was raised secular and his family observed just a few religious holidays, like Christmas. Kaufman told me he has remained secular as an adult. While he believes in God, he said, he has never been comfortable joining any organized religion. Kaufman began acting in college and has steadily worked in TV, in film and on the stage since 1999. He says he is most recognized from his co-starring role in the 2002 sci-fi mini-series, Taken, which was produced by Steven Spielberg. More recently, Kaufman has had a recurring role on the CBS series, Without a Trace. His long-term romantic partner, actress Poppy Montgomery, is a co-star of Without a Trace. Montgomery gave birth to their first child, a son, in 2007. The film Defiance, based on a true story about three Jewish Eastern European brothers who took up arms and fought the Nazis, opened in theaters this month. Reviews have been mixed, but almost all critics liked some parts of the film and the stellar cast got good notices for their acting. (For InterfaithFamily.com’s own review, see The Unheralded Heroes of the Holocaust.) British actors Jamie Bell and Daniel Craig, neither of whom is Jewish in real life, play two of the brothers. Craig, of course, is now famous as the new James Bond. The third brother is played by interfaith actor Liev Schreiber, 41, whom I have profiled before. Schreiber recently spoke to the London Jewish Chronicle about his work in Defiance and gave a few new details about his personal life. He said he was reluctant to do another Holocaust film after directing and writing Everything is Illuminated (2005). However, the power of the Defiance story drew him in. Schreiber’s and Watts’ first son, Alexander Pete, whom they call Sasha, was born in July 2007. (Sasha is the Russian nickname for Alexander.) In December 2008, Watts gave birth to their second son, Samuel Kai. Defiance musical composer James Newton Howard, 57, recently told the Los Angeles Times that his work on the film had special meaning for him. Regarded as one of the top film composers in the world, Howard has been nominated six times for the best score Oscar.